Corpse Flower Records and CV Books have joined forces for the release of Morbid Tales! 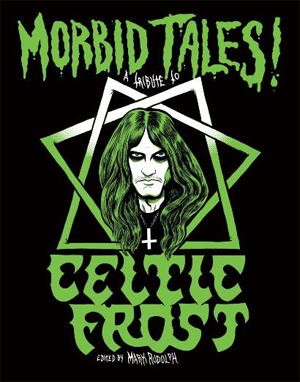 An Illustrated Tribute To CELTIC FROST, a mammoth 155-page comic with illustrations and illustrated anecdotes from a varied bunch of metal musicians/authors. Edited by renowned illustrator Mark Rudolph who's crafted artwork for the likes of CARCASS, COALESCE, BATTLECROSS and more in addition to regular contributions to Decibel and Metal Hammer Magazines, Morbid Tales! An Illustrated Tribute To CELTIC FROST serves as the follow-up to Rudolph's 2012-released Satan Is Alive; A Tribute To MERCYFUL FATE and is the second in a planned trilogy of metal-centric graphic novels. Less a literal take on the subject matter than that of the MERCYFUL FATE book, Morbid Tales! delves into the world created from FROST's music rather than translating lyrics and boasts an extraordinary list of work from the likes of Rudolph, Justin Bartlett, Jason McGregor, Bruno Guerriero, Lars Krantz, Chuck BB, Shawn Knight (CHILD BITE), J. Bennett (IDES OF GEMINI), Eamon Espey, Ed Luce. Jeremy Baum, Johnny Ryan, Josh Bayer, Jacob Hamrick, J.T. Dockery, Kelly Larson, Kim Holm, Michael Hacker, Mike Erdody (TEMPLE OF VOID/ACID WITCH), Slasher Dave (ACID WITCH), Tim Shagrat (ACID WITCH/REAPER/SHITFUCKER), Ravn (1349), Tom Neely, Sam Wolf, Tim Sievert, Mark Thompson, Scott Murphy, David Liljemark, Kevin Cross, Rob Mills and others. Additionally, the book includes forewords from Tomas Lindberg (AT THE GATES) and Ivar Bjornson (ENSLAVED) with additional pieces from Joel Grind (TOXIC HOLOCAUST), Flo Swartz (PYOGENESIS), Ben Ash (CARCASS), Scott Kelly (NEUROSIS), Fenriz (DARKTHRONE), Dan Lilker (BRUTAL TRUTH), Jeff Wagner (author of Mean Deviation), Shane Embury (NAPALM DEATH), Greg Macintosh (PARADISE LOST), Trevor Peres (OBITUARY), Scott Carlson and Matt Olivo (REPULSION), Orvar Säfström (NIRVANNA 2002), Attila Csihar (MAYHEM), Chris Reifert (AUTOPSY) and John Paradiso (EVOKEN). Corpse Flower will also be issuing an accompanying, limited edition LP of CELTIC FROST cover tunes later this year. Preorders are being taken at this location.